Keeping your customers engaged and up to date with your brand is vital if you want their repeat custom, and email marketing is one of the best ways to do it. But what if you’re not getting the open or click through rates that you’ve expected? It’s always disappointing when you’ve spent a lot of time carefully crafting an email campaign and you don’t get the results you hope for. The important thing is to not tear everything apart and start again from scratch, especially if you’ve had previous success. Most likely, there are just a few tweaks that need to be made to start improving your click-through and open rates. So don’t panic, you’ll be back on track in no time. Whilst this may seem obvious, you’d be surprised at the number of event organisers that don’t optimise their email for mobile devices. And it’s so frustrating. Having to scroll left and right on a non-optimised email is a sure fire way to a delete or unsubscribe. According to Blue Hornet, 70% of consumers delete emails immediately that don’t render well on a mobile device. Another reason for optimising your campaigns for mobile is the fact that more people now are opening email on their handheld devices. Looking at the graph below from Campaign Monitor, you can see that mobile has now clearly surpassed desktop in open rates. If you aren’t sure if your email messages are mobile ready, you need to take a look on your own phone. If not, get it done immediately. You’ve just spent a couple hours crafting the perfect email campaign and can’t wait to send it out there, so you just click send. Does this sound like you? Well, you shouldn’t do this. Timing is an extremely important factor when it comes to click through rates. Whilst, not an exact science, you’d do well to research a little about your audience from previous campaigns to see when you get the best results. To give you a little context, below is a graph from Get Response that shows us the best days to get open rates. Bear in mind, these statistics are not industry specific. You’ll need to do your own research, but if you haven’t already, this is a great place to start. As you can see above, the best days to send email is either Tuesday or Friday. Weekends rank the lowest because people are preoccupied doing their own thing whilst Mondays follow closely behind. I’m guessing this is because, well, who likes Mondays? So now we have a starting point on when to send the email, it’s time to focus on the specific time. Again, Get Response shows us the overall average for open rates depending on time. 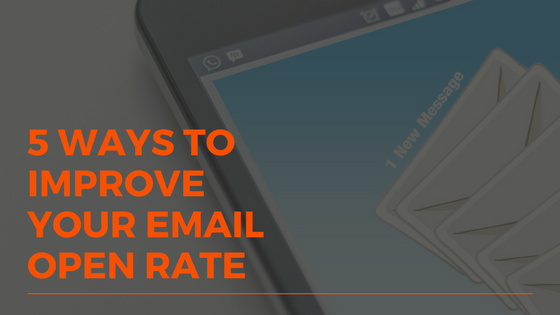 Looking above, we can ascertain that the timing of an email really does have an impact on open rate. Does your audience follow this trend? Only research will tell but if you haven’t done any, sending a campaign at 3pm on a Tuesday or Friday may be a smart time to begin. You should be spending as long thinking about your subject line as you do the actual content of the email. After all, if they don’t open it, you aren’t going to be getting any clicks. So why do people open your email? According to Hubspot, 64% of subscribers say they are likely to read your email because of whom it’s from, and 47% of email recipients open an email based on the subject line. Below is a complete graph of the other reasons. Sender name is pretty obvious, it’s just going to be the name of your race. There’s not much you can do about that. But when it comes to the subject line, that’s a whole different ball game. 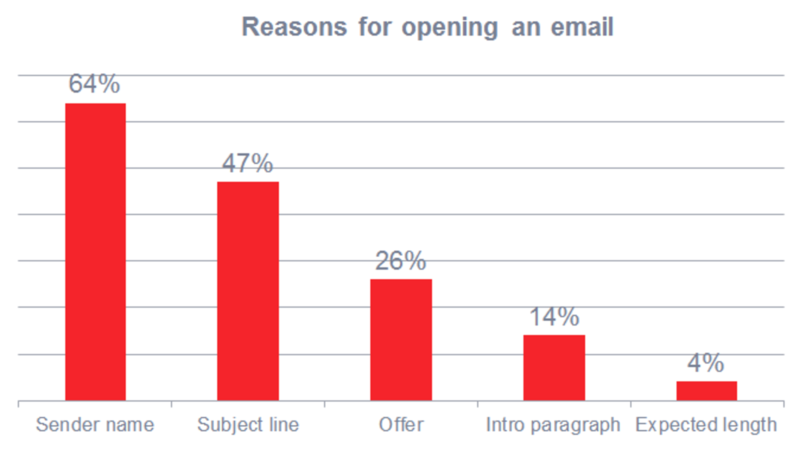 Some of the factors that can influence open rates in regard to subject lines are length, displaying value and personalisation. If you want a comprehensive look at how you can increase open rates with subject lines, check out our piece on the EtchRock Resources. Social proof is marketing terms involves showing your customer that other people are already invested in your service or product. The most common form is normally in the form of a testimonial. As humans, we tend to be more willing to do something if others are also taking part. We can utilise this form of social proof in our email campaigns. – Will you join the rest of the running community at our next event? – Our event is rated top of its class by Running Magazine, will you join us? If you’re showcasing your event, you can always use quotes from customer testimonials as well. As mentioned before, we like to know that someone has already done your event and had a great experience. Think about the popularity of sites like Trip Advisor, we rely more on the opinion of our peers as opposed to brands themselves. Don’t you just hate it when your inbox gets flooded with spam email and affiliate offers? If the email offers you no value, then you’re most likely going to unsubscribe. A great way to make an email feel more personal to the reader is by using personalisation. There are a couple ways to do it too. First off is by personalising the subject line or body of text towards the actual recipient. Just by using the person’s name in the subject has an impact on your open rate as shown in the graph below from Marketing Land. Another way to personalise an email is through segmentation of your database. In other words, breaking it down into smaller groups of which you know in what they are interested in. By doing so, you will be able to create more personalised and email campaigns based on the specific audience that you are targeting. The guys over at Optinmonster wrote a great article on 50 different ways to segment your list if you’re stuck for ideas. If you’re just getting started with email segmentation, the best place to start would be to segment your subscriber list into two categories. Either purchased a ticket for your event or not purchased a ticket. From here, you can start the process of developing custom campaigns for each audience, as the messaging will be very different. For those who haven’t yet purchased a ticket for your event, you should focus on the USP’s of your event, what makes it stand out from the crowd and potentially discounts for first-time buyers. The goal here is to get people to purchase their first ticket. Once they completed that process, you can then move them over into the ‘bought a ticket’ segment. For the seasoned racers, you will want to focus on ‘content’ based campaigns that are a reflection of their race experience. Photos of the participants, video content from the race and any other ‘sharable’ material are what you want to target this segment with. Ultimately, increasing your open and click through rate comes more from external factors, knowing your audience. If you know what your audience wants, you’ll be in a much better position to target them with appropriate content. So get A/B testing and stat trying to optimise those campaigns! Our content is custom written for event organisers, charities or brands in the endurance racing market. Join the family!